Addiction and mental illness affect everyone, from the homeless to the highest-earning businessman. These well-known problems are a common trial among many walks of life, even politicians like Patrick J. Kennedy. A former congressman and the youngest child of Senator Ted Kennedy, Patrick Kennedy faced co-occurring conditions of bipolar disorder and an addiction to prescription painkillers. In May of 2006, Kennedy, who was at the time a congressman for Rhode Island, crashed his car into a traffic barrier on Capitol Hill. Almost immediately he decided to seek treatment for his addiction and mental illness. For some, this could have been the end of a career. For Kennedy, however, it was the beginning. After his struggles became public in 2006 and he sought treatment, Kennedy became an advocate for mental health and substance abuse care, research and policy both within Congress and in the country at large. The result of the combined work of Kennedy and Stephen Fried, “A Common Struggle: A Personal Journey Through the Past and Future of Mental Illness and Addiction” not only looks back on the former congressman’s personal battle with mental health and addiction but also takes a look at the country’s history of mental health care alongside the private struggles that every family goes through. The book combines Kennedy’s professional and personal stories and focuses on the time between his problems became public and the present day. 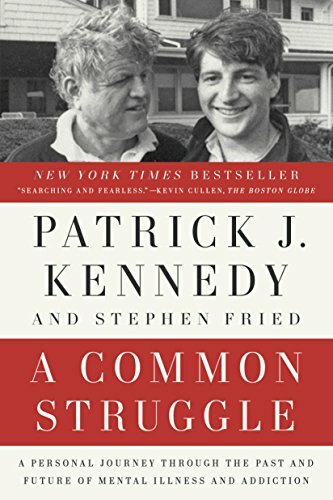 “A Common Struggle” takes a long look at Kennedy’s journey toward his own recovery and analyzes the American tendency to treat mental illness as something that stays out of sight as a family secret. In addition to discussing his own story, Kennedy seeks to provide a plan to bring equality to the mental health community and create a plan for the future of mental health policy. This book works as a call for empathy for a situation that affects many families as well as a call to action. Patrick J. Kennedy is a former member of the U.S. House of Representatives and a leading political voice on mental illness, addiction and other brain diseases. Kennedy fought to end medical and societal discrimination against mental illness and addiction, highlighted by his lead sponsorship of the Mental Health Parity and Addictions Equity Act of 2008. He founded the Kennedy Forum, which unites the community of mental health, and co-founded One Mind for Research, which sponsors brain research and open science collaboration. He lives in New Jersey with his wife, Amy, and their four children. To learn more about Patrick Kennedy, go to www.patrickjkennedy.net. Stephen Fried is an award-winning magazine journalist, a best-selling author and an adjunct professor at Columbia University Graduate School of Journalism. He authored two books on health care, mental health and addiction including “Bitter Pills: Inside the Hazardous World of Legal Drugs” and “Thing of Beauty: The Tragedy of Supermodel Gia” along with the books “The New Rabbi,” “Husbandry” and “Appetite for America: Fred Harvey and the Business of Civilizing the Wild West – One Meal at a Time.” Fried lives in Philadelphia with his wife, author Diane Ayres. To learn more about Stephen Fried, go to www.stephenfried.com. Brianna Gibbons is a data editor for Sovereign Health. She graduated from Westmont College with a Bachelor of Arts in English. She currently works hard to organize and publish the content created by Sovereign Health for the blogs and websites. In her spare time, Brianna loves to read, write, knit, travel, dote on her pets and randomly go on small adventures with friends. For more information and other inquiries about this media, contact the author at news@sovhealth.com.